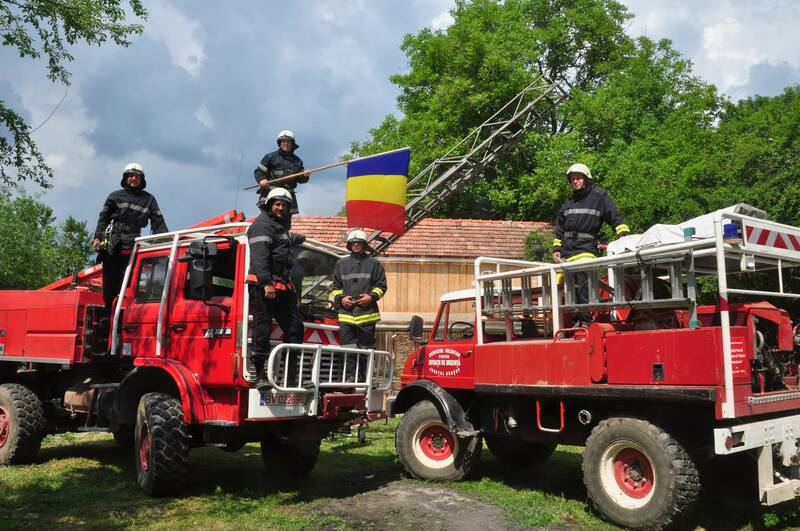 A Frenchman has created a volunteer firefighter brigade in a small village in Romania’s Transylvania. He now works on setting up a first aid point in their community, where ambulances arrive after 40 minutes. For a month and a half, Erwan Joliff drove his motorbike across 250 villages in southern Transylvania. He drove across the hills, sometimes with his eyes towards the Fagaras mountains’ shadow in the skyline, other times, gazing over the Transylvania plateau. It was late 2003 and the Frenchman was looking for a place that would call to him like no other. In the past three years, he had been planning to make Romania his home and this was his last chance. Then this village appeared, very close to the forest. It was small and seemed rather chaotic, unlike the other Saxon villages in the area. It was far from the road and looked abandoned. Erwan saw its gardens, then its ruins, and discovered there were few people in that village. A few months later, he moved there. He bought a house in the highest area of the village, overlooking the Fagaras mountains. Erwan has been living in the village of Cobor for the last 14 years. Some 250 people call this village home. They're 20 kilometers away from the town of Fagaras and close to the mountains of the same name. “Of all the villages I visited, Cobor was the only one that attracted me. It is a sign that the whole story is some sort of a calling. I think there’s nothing random in my Romania story. I say this without any doubt, after 14 years of living in Cobor and 25 years after my first encounter with Romania,” says Erwan. When he was 15, Erwan Joliff wanted to become a firefighter. Then at 17, he thought about becoming a priest. He went on to study philosophy and then theology in Brussels. “I always wanted to do something to <save> people, one way or the other,” he says. For two years during his university, in the mid-90s, he was a volunteer in Romania, at the French Embassy, teaching French history and language in two high schools and a University in Bucharest. His first encounter with Romania changed him. “It was a powerful experience which changed some things in me. Going back to France, I started to think about living in a different world than the one I had grown up into,” he adds. Romania became a possibility only in 2000, after a long road trip adventure between Bucharest to the south and Satu Mare in the north. “I took a straighter line as possible and did not care about the road condition in this trip,” Erwan remembers. That was when the idea of living in the Romanian countryside became clearer to him. To prepare for his life in Romania, Erwan trained for three years on construction sites in Brussels during the day and in the evening, he took mechanics classes. “A mix between philosophy, theology, manual labor and technical knowledge – I would say a good mix to face the challenges in Romania. I don’t think I would have resisted for so long here, without the moral support of my years of studies and without my manual labor abilities,” he admits. 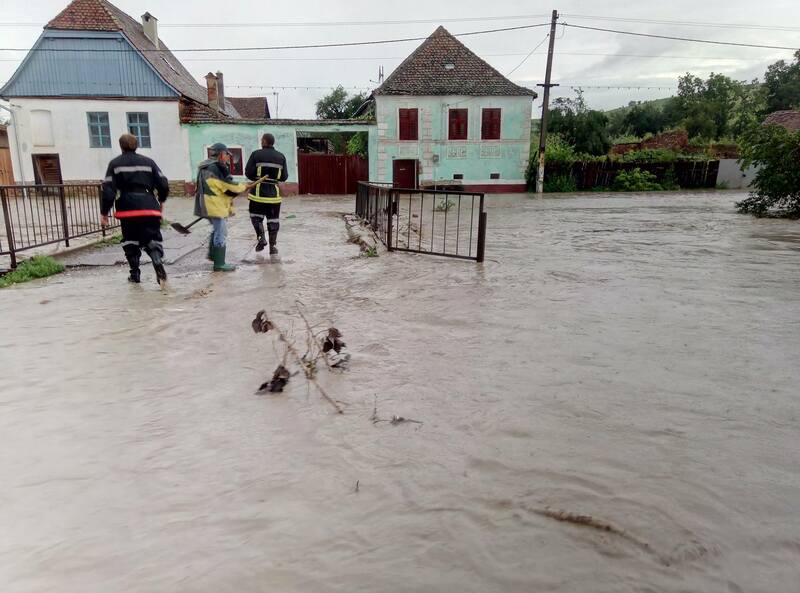 This July, the village of Cobor was flooded after massive rain. Erwan and four other volunteers – a German and three Romanians - have spent days and nights trying to fight the flooding. They helped remove water from people’s cellars and during long hours, they removed debris from under flooded bridges. They are the firefighters of Cobor. The Frenchman started with the commune’s official firefighter brigade in 2012. 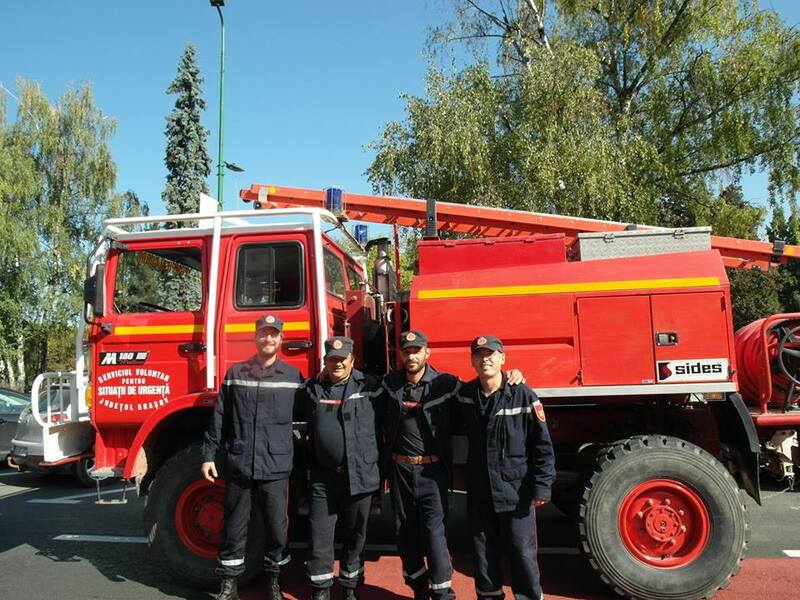 He managed to get a firefighter truck donation from France and the local authorities helped by paying for the delivery of the truck, they bought a water tank, paid for gasoline and for training courses. But in time, the official support diminished, until Erwan had to cover the expenses by himself. In 2017, he created an association and this year, from donations, they bought their own firefighters truck. “Now we have our own budget and we manage. We cover 9 villages and 4 communes in the area,” says Erwan. Their budget of about EUR 2,000 a year cover insurance for the truck, taxes, insurances for the staff, gasoline, labor protection, and investments and repairs, all funded through private donations. This year, they intervened in three fires, helped in a tractor accident and helped for several days during the summer floods. They want to show they can help in any emergency situation. Erwan speaks fluent Romanian and is also a volunteer on the ambulance of SMURD Fagaras, part of the Emergency Situations Inspectorate ISU Brasov. He took on this challenge as well as he wants to learn and train for the future first aid point he is building in Cobor. As ambulances take up to 40 minutes to arrive in their village, which is often too long, he wants to be able to intervene faster and stabilize the patient until the ambulance arrives. One of the old houses Erwan has bought in the village is close to becoming the first aid headquarters. He has invested about EUR 10,000 of his own money and worked to renovate it in the last two to three years. “I always find solutions to reduce costs. I run a sawmill so that lowers the costs with wood. I buy bricks and tiles second – hand. I use stone recovered from ruins. The things I have to buy from stores are more expensive. This first aid point has to respect certain standards; on the inside, it will be like a modern medical unit, so the expenses with this one were higher,” Erwan explains. For his own house, he used mostly simple, traditional materials. He also worked a lot with volunteers on all of his projects. It was through volunteering that Erwan met his wife: four years into his life in the village, the German woman arrived as a volunteer at one of his projects. “Romania has given me many good things, among which meeting my wife. We now have four children,” says the Frenchman. The local authorities' lack of support for his firefighters and first aid projects has pushed Erwan into politics; he aims for a local counselor seat in the next elections. “If the current mayor supported my firefight brigade project, I would have never entered politics,” says Erwan. This year, he became a member of the Uniunea Salveaza Romania (USR) Brasov. “For our commune which has two villages, the city hall spends about EUR 1,500 on a firefighter service which does not exist. Most of the money goes to life and social insurance for people who do not go to interventions,” says the Frenchman. He hopes to get funding from the other communes which benefit from their volunteer services after some EUR 650 were approved for them in the Ticus council. “If it was only about the village of Cobor, I would have wanted to become a mayor. I know the people here and the problems we all face and I have plenty of ideas to take us forward,” said Erwan. But there is another village in the commune which he feels he does not know enough to run. “I am not looking for a position. I just want to get the job done, improve things around here,” he adds. On social media, he is known as the Frenchman of Cobor (“Francezul din Cobor”) and he often reveals irregularities in how the local authorities are doing their job or how the commune is managed. He is not afraid to speak out. “The current mayor lacks courage and a minimum sense of responsibility. He is scared of my ideas, and instead of helping me, he does all he can to undermine me. Unfortunately, this is the standard for many mayors in Romania. People looking for high positions and advantages, who are willing to pay to get them while being complete strangers to what the real mayor work should be,” says Erwan. The Frenchman could see himself becoming deputy mayor in their commune instead. “It would suit me, the deputy mayor should take care of community management, and I have a lot of ideas for this. I have already implemented solutions in the village – the firefighters' brigade and the recycling program,” adds Erwan. “If I can implement the projects I want, I don’t need to go further than being a deputy mayor.” But the Frenchman is also ready to continue to fight from the opposing side if the existing mayor will get another mandate. “With small initiatives such as the firefighters, we can develop our local community and help people know each other better,” Erwan believes. There’s a lack of community in his village, he discovered. People don’t accept each other, newcomers don’t get involved and all that results is the lack of interest for the good of all.